I recall there was a time when Indonesians, particularly those in Jakarta, were hit by the frozen yogurt fever. Pretty much like the phenomenon that swept other cities, it was quite rampant here. Long and snake-like queues outside the fro-yo parlours was a common sight, and you guessed it, it only got worse on weekends! As far as my fragile brains are able to remember, the fro-yo fever in Indonesia was triggered by the arrival of Sour Sally. It was the first name that introduced the concept of freezing yogurt and served it like soft-serve ice cream but with healthy fruits as toppings. But, of course, like in any other businesses, seeing such huge demand of such novel product, other competitors started springing up. Sour Sally’s rivals ranged from the ultra high-end parlours, to fro-yo wannabes that only pleased the wallet but not the cravings. Sour Sally, being the pioneer of this market in Indonesia, was the most stubborn, or I should say, persistent in sticking with its limited menu. While others had come up with all sorts of calories-packed, diabetes-causing yogurt flavours, toppings and sauces, Sour Sally stuck with its healthy menu. As a dessert person, I’d always crave for something sweet and I can eat ice cream like it’s mineral water, but the calories in those ice creams are horrifying. My concern was much more eased with the arrival of such healthy, low-fat and low-calories snack. That was years ago though and today, our #Handmate is back and kicking with its new and unique offerings. Sour Sally loyal fans, hold your breath because you will fall in love even deeper with the iconic Sally! So, what are the changes that have taken place? Firstly, the branding. From the outlet design and the branding materials used, the #AllNewSourSally now incorporates plenty of black colour, but of course it still keeps its signature neon yellow and green in the design. Next, the menu. 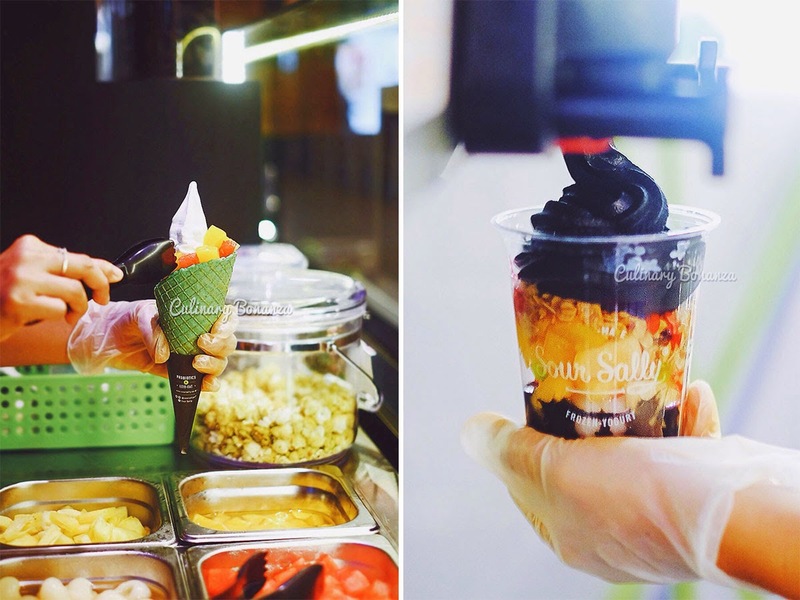 Sour Sally’s newest frozen yogurt flavours other than the Original Plain, are Black Sakura and White Skim frozen yogurt. The world’s first Black Sakura frozen yogurt is actually a combination of Sakura blossom flavour, packed with natural activated charcoal (hence it’s black, not from artificial colouring), which is known for its health benefits as body detox and is high in antioxidants. Whereas the White Skim yogurt is enriched with Greenfields Hi-Calcium Skimmed Milk, making it creamier and smoother than Sour Sally’s Original Plain frozen yogurt. The already healthy and live probiotics-rich frozen yogurt, is now even healthier and guilt-free. Some used to complain about Sour Sally’s limited option for toppings, but now they can shush up, because they’re getting their wishes fulfilled. I was quite surprised to see the numerous healthy Homemade Crunchies, Unique Sauces and Wholesome Fresh Fruits. These selection of toppings are not the sort that can bought off-the-rack, nor at any retail store (as these are made exclusively for Sour Sally). Some of my personal favourite Crunchies are Granola, Caramelised Sunny Seed and Milo Malt. As for the Unique Sauces, I love the Milo Myers and Matcha Latte. But those are not the only changes, let’s also welcome Lykone and Riche, the latest addition to the existing Regular / Large cups. For those who like that extra crunch, Lykone’s would perfectly fit 2 toppings of your choice and your choice of yogurt flavour. This cone of happiness (literally so, because the name is derived from a Norwegian word ‘Lykke’, meaning Happiness and an English word ‘Cone’) will cheer you up with its bold Black or bright Red, Green, Pink or Yellow colours. Be Happy, #BeLykone! 5 colours of Lykone to choose from! If you like to have many many toppings to go with your Sour Sally, then Riche is the one for you. With Riche, you can choose 5 toppings (1 crunchies + 1 sauce + 3 fruits) to go with your choice of frozen yogurt. Its name, from a French word that means ‘rich’ literally, is rich in natural vitamins and nutrients from the fruits, nutritious crunchies and luscious sauces, as well as Probiotics, which is good for your guts. With The All-New Sour Sally, feel rich, #GetRiche! Whether you want your Sour Sally in a Lykone, a Riche or a Regular/Large Cup, there will be endless combinations of flavours that you can create. Your imagination is the only limit! Oh, you will also find Sour Sally’s brand new cute spoon at the store. Wouldn’t you want to high-five this tiny green hand? =D High five to the good life! As a dessert person, I’d always crave for something sweet and I can eat ice cream like it’s just some mineral water, but the calories in those ice creams are horrifying. My concern was much more eased with the arrival of such healthy, low fat and low calories snack. My post-workout and weekend treat just gets even better, because with #AllNewSourSally, #ItsFitNotFat, #BetterThanIceCream and #TasteWithoutGuilt. Join the celebration of the rebranded Sour Sally and you might even win an iPhone 6 and get 10% discount off your next purchase. Here are the details that you need to know (and it’s really simple, I promise). 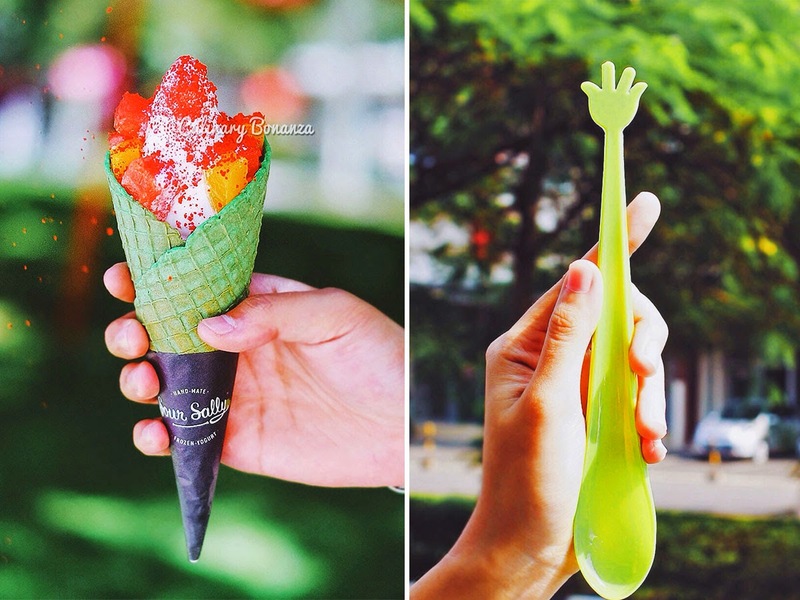 Snap and post a #Handfie, holding any of the #AllNewSourSally products on your own Instagram / Twitter accounts. Show the post to the outlet staff to receive 10% discount off your NEXT purchase and to stand a chance to win an iPhone 6. 1. Follow @soursallycoid on instagram/twitter. 3. Tag 3 of your mates to let them know you're enjoying The All-New Sour Sally frozen yogurt. - Everyone is allowed to submit as many photos as you want. The #handfie photo you posted will entitle you to 10% discount off your next purchase (the discount is valid until 30 April 2015). - This AllNewSourSally #Handfie contest runs from 5 February - 30 April 2015. - Winners will be announced on @soursallycoid Instagram / Twitter in May 2015.